Rotary swaging is a high-performance forging process for hollow and solid parts with an elongated axis. Rotary swaging is used in the manufacture of various parts for the automotive, aerospace and defense industries, for example, in the production of pipes, hollow steering columns, drive and guide shafts as well as various fasteners. Rotary swaging significantly reduces the production cost of such components as compared to machining processes and also increases strength properties of the components. The process of rotary swaging utilizes two to six dies for radial forming while the workpiece is moved axially forward and/or backward. The dies may perform up to 10000 strokes per minute and their displacement might be as little as 0.2 mm per stroke. Parts, in most cases, require no additional mechanical processing, which saves metal and reduces production cost due to the high precision of the surface obtained through the process. Strength properties of parts produced by rotary swaging are significantly higher which allows swaged hollow components to replace traditionally manufactured solid components for a significant reduction of the finished product mass. Rotary swaging allows higher degrees of deformation compared to conventional metal forming processes without the need for intermediate annealing, consequently reducing the number of operations required for manufacturing finished parts. A relatively short simulation time with a local deformation zone due to implementation of specific dual mesh algorithms. Prediction of material flow during the whole forging process. Determination of the number of strokes, feed and rotation values for set up of the technological process in the press. Prediction of the fibrous structure into the volume of the workpiece. Identification of defects into the volume of the forged piece. 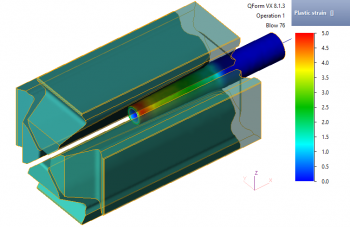 Simulation of the stress-strain state with calculation of the die wear and tool life. 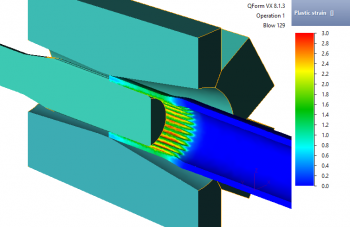 Special QForm features that help simulate rotary swaging processes. Convenient and fast setting of boundary conditions for a forging manipulator. Convenient import of tables with workpiece feed and rotation values from Excel. Dual mesh determination function for simulation of multi-stroke processes with a local deformation zone. Convenient description of the complex process kinematics. 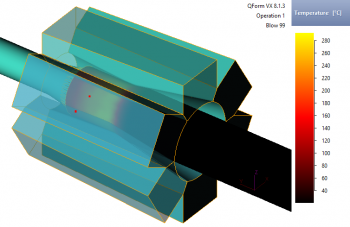 Advanced algorithms for simulation of coupled workpiece and die tool deformation ensures the highest calculation accuracy.